Sitting in six acres of native bush and Bordeaux grape vines is the stunning Puriri Valley Lodge on Waiheke Island. 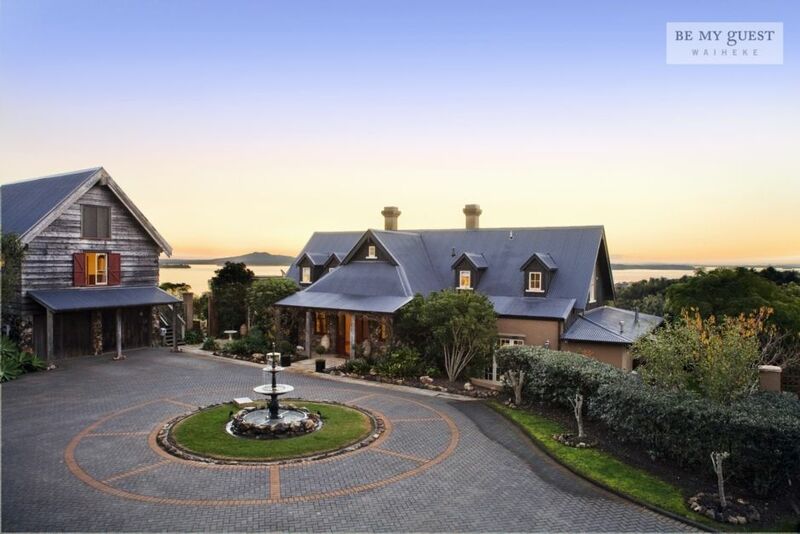 The European influenced House and Barn look out to stunning views of Rangitoto and the Hauraki Gulf. Surrounded by private walking tracks, sprawling lawns, fruit trees and its own petanque court, this is a truly special place to visit. The beauty of the setting is mirrored by the comfort and detailing of the house. The large open plan living and dining rooms look out across the garden towards sea views and Auckland, with a double sided open fireplace separating them. The large French style kitchen is an entertainers dream, while the outdoor eating area also has an open fireplace. Puriri Valley Lodge has eight bedrooms and five en-suites, so is perfect for celebrating a special occasion with the extended family. It is also ideal for corporate getaway's or for the family to stay for a wedding at one of the nearby wineries. In the main house, the master bedroom has a roof top spa pool, where you can relax with a glass of wine at the end of the day and enjoy the breath-taking views. For guests who want to enjoy Waiheke’s wineries, the award winning Cable Bay Restaurant and Mudbrick Restaurant are only a few minutes drive away. The Lodge is named after the ancient Puriri trees in its six acres of pristine native bush. The property has private walking tracks, which link to stunning public walking tracks around the Western end of Waiheke Island. Or walk to one of the stunning sandy beaches nearby. The lodge is located in Church Bay and at the western end of Waiheke Island. It’s only five minutes from Oneroa and the Maitiatia Ferry and wineries. Please note: there is a cleaning and linen charge of $30 per person per stay. Quote will base this on max 18 pax, we will adjust if your group is smaller. The property is not to be used for any parties or gatherings attended by people other than those staying at the property, unless agreed on booking. One of Waiheke's most spectacular properties, Puriri Valley is a huge estate with stunning vistas and multiple entertaining areas. The property is set in lovely established gardens, sits above its own vineyard and enjoys stunning views stretching out over the Hauraki Gulf. The estate includes a luxury villa style house, as well as separate barn & studio. There is plenty of room for the whole extended family! Multiple living and dining areas, great for a special celebration or an extended family holiday. Perfect for corporate groups. We had a great weekend. Only small comments are that the photos of the property are slightly misleading. For example, the fountain looked very forlorn with cobwebs on it. Clearly hasn't had water for a while. Not exactly the impressive welcome you are expecting. And the grapevines obviously have not had any vines for a long time so, again, not the lush outlook you expect. Otherwise, we had a great time, thanks. Thanks for taking the time to provide feedback - it is always useful. I agree that the photos are about a year old and quite a lot has changed in this property in a year! A lot of the furniture has been replaced and yes the grape vines have been removed. In fact the fountain has never worked! But I will arrange to get the photos updated. We hope you had a great stay! We loved our stay it was perfect for our stay during our wedding on waiheke. We can't wait to come back and stay on our anniversary. This property made our stay a breeze and was so close to mudbrick we didn't need drivers to and from the wedding. It is a great spot isn't it? Please do come back again! The place is FANTASTIC, we had the best time and felt like we were in the lap of luxury. The place is FANTASTIC, we had the best time and felt like we were in the lap of luxury. amazing views and facilities, wonderful! It is special, we are so pleased you had a great time! Please do come back again! Amazing property, cant wait to stay there again over Summer. In a rural setting, with lovely views across a valley & out to sea. Conveniently located just a short drive from the Maitiatia Ferry terminal and the charming Oneroa village, and a few minutes more from the Kennedy Bay car ferry terminal. There are lovely walks nearby, including a walk from the front gate down through native bush to a secluded beach. Lovely longer walks around the Park Point peninsula. Down the road some of the islands best wineries - including Mudbrick & Cable Bay. Within a 15 minute drive are many more fabulous wineries, award winning restaurants & great beaches!